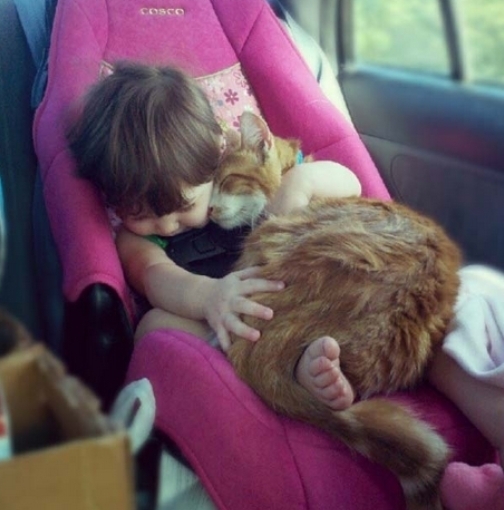 The Best “Security Blanket”? Probably! This reminds me of a time when I was in college, back in the 80’s. We had six Siamese cats in the house and they’d try their best to get into my bedroom. I was working 3rd shift, going to school 1st shift, and sleeping during the interim hours. It worked out well for me because I was wide awake for my first classes at 8:00 AM. But, one evening, my mother decided to check on me and to see if I would want to eat dinner. She closed the door, but it didn’t latch. So, at around 10:00 PM, when I was waking up, all six of the cats were on top of me, in a little bundle, on my chest and stomach. I couldn’t move an inch, but it was the most comfortable, wonderful feeling. And, I’ll never forget that evening.